If you finally want to make your New Year’s Resolutions come true this year, the time to do something about is now; otherwise, you’ll end up in the same place as you were the year before. Your goal can be as simple as losing a few pounds or as hard as earning that much-needed promotion at work. Any way you spin it, you’re going to need to be organized to accomplish your goals. 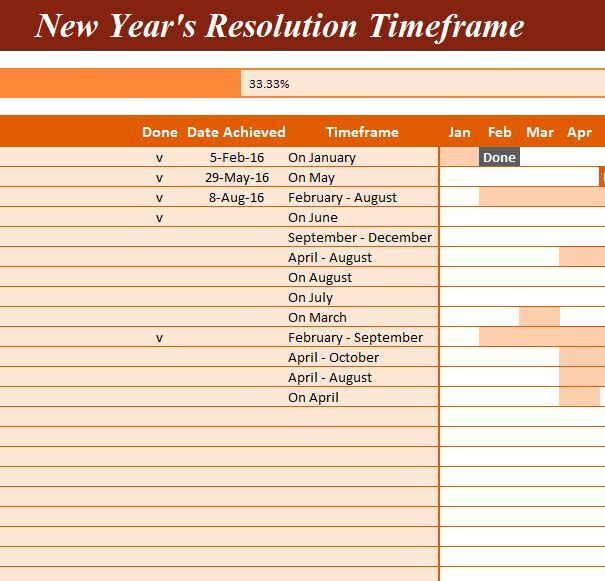 The free New Year’s Resolution Timeframe is here to help you plan out the specifics of your goals and help you complete them in the most effective way possible. Give it a try by reading the information below. The free document is available by clicking the link at the bottom of this page. Begin by entering the current date at the very top of the screen and continue downward. This template is as easy as possible to use and will seem pretty intuitive once you have downloaded the document and had the opportunity to look it over for a second. In the first column of the document, you can enter the goal that you want to achieve and mark it as complete or in progress. You can also enter the date that you completed your goal or a part of it in the next few columns of the document. The template will automatically show you a calendar, off to the right of the page, where you can see your overall progress toward your specific goal. You will also notice that a progress bar back at the top of the screen is also keeping track of your progress as well. Gives you a calendar overview of your goal progress. Allows you to set timeframes.